Pizza is one of the most recognized dishes and certainly one which is often selected by children and young people as their favorite food. Pizza is very easy to love...the crust, sauce and other Italian ingredients smell heavenly as they bake to a golden finish.. Growing up, we did not have pizza delivered to our home very often, but when we did it was an event that caused a lot of jumping up and down. My dad would go to the door and pay for the pizza and tip the driver. As he carried the cardboard box carefully to the kitchen, we surrounded my dad like a hungry, drooling mob. He would lift the lid and the fragrance would perfume the air. Cheese and sausage was what he always ordered; actually, there were't many other choices. Something happened to pizza, however, as interest in it exploded. Today, almost anything can be put on a pizza and enjoyed by someone somewhere. I also remember the state where I had the worst pizza I ever ate...it shall remain nameless...but, the crust was like a cracker and the sauce was probably ketchup...I also remember we got up and walked out. Frozen pizza does not usually measure up to those freshly made, but there are amazing things that can be done with a simple cheese pizza to make it a real treat. 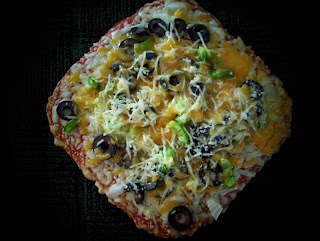 There is no reason to buy a frozen pizza and just cook it...adding favorite toppings is just too easy. (I don't like the meat on frozen pizza...too greasy). This delicious looking pizza is a little Tony's Pizza...it was on sale for $1. Ingredients are to taste and are added to the Tony's pizza, in the order given. Bake as directed. You might have to add a minute or two to the baking time. Marian wrote: Your additions to Tony's pizza really make a difference. I have been pleased with the Red Baron pizzas that I've tried--I only buy them on sale, of course. When I was growing up, we had never heard of pizzas, so we didn't order any. Another reason was that we didn't have a telephone (or electricity). I really enjoy your food memories.